This car was sitting idle in Jimmy's garage for the last 10 years. With little progress being done. Well Jimmy decided he would like to be driving the Javelin this summer. This is when he found us, thanks Chris. Well after a few conversations with Jimmy we came up with a game plan. Keep the engine stock for now. Change the 4 speed to a 5 speed and not just any 5 speed. We went with a Tremec TKO 600 to handle the projected horse power. Change the week AMC rear to a narrowed HD Ford 9" posi unit. Change the drum brakes to disc brakes. Remove the leaf springs in favor of a 4 link coilover setup. Finish installing the rack and pinion coilover set up in the front. Adding sway bars front and rear. Change the mechanical clutch linkage to a hydraulic setup. 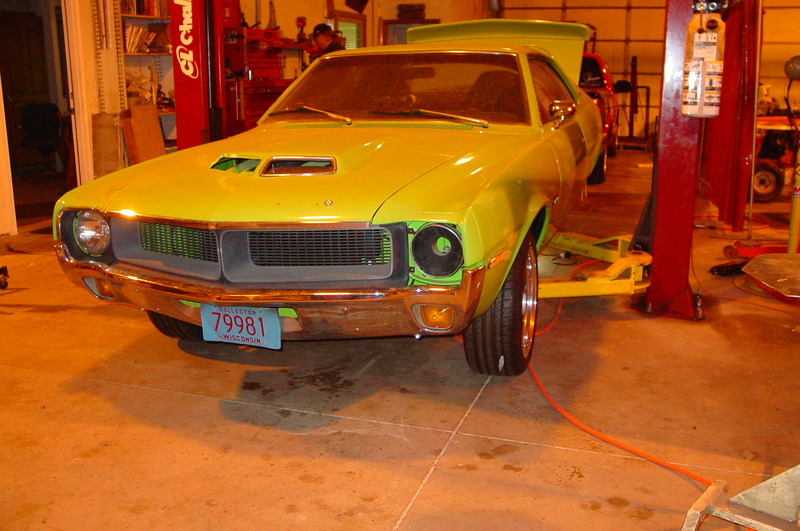 Build a custom mandrel bent exhaust system with an X pipe running through twin Flow Masters. Add a custom alignment designed for aggressive street driving and were almost done. Add a pair of custom seat mounts along with some seat belts and a new carpet for the floor. This car is starting to come together. Next up will be a custom roll cage Midnight will be installing this winter. Roll cage is in, Interior in in and the Javelin is on the road again. This time She is powered by a built 401 making some serious power and scaring the patrons at the drive in..